Patricia soon learns that Michel is on the run when the police question her. With Michel having declared his love for her, but with Patricia unsure if she reciprocates the affections (treating his company like a personal test, giving him a chance to win her over) she aids him and becomes what the law would consider an accomplice. Eventually, in true noir style, she decides she doesn't love him and reveals his whereabouts to the police. The concluding scene is famous. Having been shot, Michel tries to escape but after a lengthy staggering run (aided by a brilliant, innovative shot) collapses on the pavement. Breathless includes elements of the noir thriller. Throughout the film, Michel is forced to resort to his skills as a criminal, robbing strangers of their money and stealing replacement vehicles. His life of petty crime (with the exception of the killing, which strangely doesn’t seem to impact Michel) is an inescapable part of who he is. His natural instincts, which stretch to his attempts to charm Patricia, are rarely ever contemplated. Forever shot with a cigarette hanging loosely out of his mouth, Belmondo, influenced by Humphrey Bogart (who we see in poster form at one point in the film) is a charming, talkative and somewhat naive punk who tries to replicate the hard boiled criminal. I bet Godard never expected his own upstart protagonist to be such an influence either. The film is also a romance, in the classical sense. Michel is a flirt and a romantic and manages to seduce Patricia all over again. The film’s longest scene is inside Patricia’s box-like apartment, where the two share compelling discussions on various existential, social, cultural and personal topics while climbing in and out of bed together. In this 'close quarters' technique they also quote Faulkner and discuss a painting by Renoir. They re-kindle their romance as though it were a game, succumbing to natural instincts. 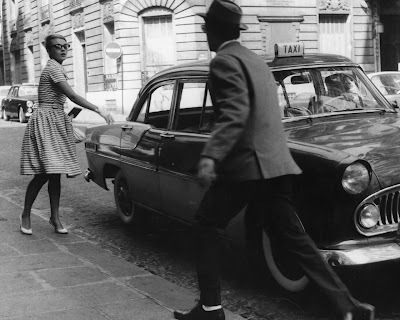 I love Godard’s use of the camera – sweeping in observatory motion and seeming to stalk the characters as they walk. He shows great awareness of the city surroundings. Godard had originally envisaged Breathless to be a documentary – and in many ways the film does feel like a series of natural captures and exchanges between very real people. Often the camera lingers on an unrelated object or person before locating the intended subject, usually Michel. The film is very ‘on-the-fly’ – the use of hand-held, the limited artificial lighting, the extenuation of the close-up. Also, sequences are never rushed and seem to be improvised by the actors. I also loved the jazz-heavy score, which gives the film a youthful energy. From my experience, being young, carefree and in love has never been captured in this way outside of a Godard film. I did spot similarities in Masculine Feminine, which may have been self-reflexive. While the importance of this film and it’s breadth of appeal can be attributed to Godard’s innovative style, the screenplay is co-written by Francois Truffaut, who’s groundbreaking masterpiece, The 400 Blows, is another film associated with the commencement of French New Wave cinema in the late 50’s. You also get the sense that Godard is in love with Paris, and while we get the token shot of the Eiffel Tower, the hustle and bustle of the streets and the quaintness of the cafes are also realized through the film’s evident romanticism. This is the first film in my director spotlight on Godard. I was impressed by his work here, and look forward to A Woman is A Woman next. I loved this film. It's been a while since I saw it first, so I don't remember quite a bit, but I do remember the scene in the bedroom and the love for Paris and the ending ofcourse. 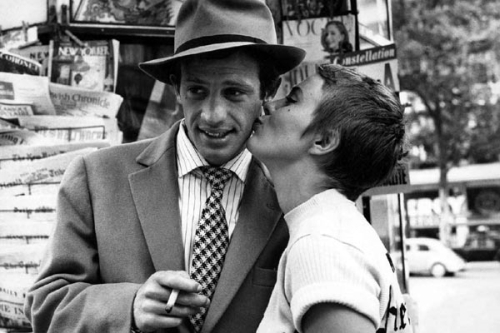 I also remember falling in love with Belmondo and his smoothness and bad-assery. I can't exactly explain why I like Godard's stuff so much without sounding like a snob (or an idiot, you choose), but the way real life events and the philosophies or thoughts of the characters sort of mix is very unique. I like the stylish aspects as well as those random meaningful things they say, you know. I guess that's what French New Wave is all about, but I have only seen the works of one other New Wave film maker- Truffaut, and all these things are just so much more pronounced in Godard's films. I recently saw A Woman is A Woman. It's so cute. And Anna Karina is lovely. Great review. I must revisit this film sometime soon. Godard... I should really get up and watch his films some time. Or right now. 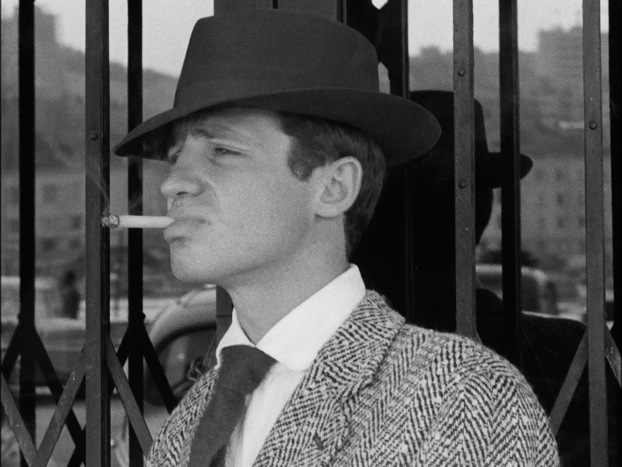 @ Nikhat - Belmondo was a badass. Such a smooth dude. I like the way he ties cultural references, a critique of culture and interesting philosophies into his characters. Truffaut is great too (The 400 Blows esp) but I am looking forward to continuing with Godard. I am in love with Anna Karina! @ Mette - Yeah, he is pretty essential! I am very behind on his work. I should probably rewatch this movie. You saw honesty and romanticism but what I saw was the subversion of the noir genre into something really playful and inconsequential but not in a bad way. When spoiler, Patricia kills Michel, I felt like he was gonna get up the second Godard would say cut. If that makes sense. But yeah, Godard will get more serious as his career, starting from Bande a Part.